SUVA, Fiji – Fiji Prime Minister Frank Bainimarama appeared set for a comfortable election victory Thursday as voters in the coup-plagued South Pacific nation opted to stick with the former military strongman who led a takeover in 2006. Bainimarama, 64, led a bloodless coup 12 years ago but now declares himself a convert to democracy, vowing to end the instability that saw four governments toppled between 1987 and 2006. Preliminary results with almost three-quarters of votes counted gave Bainimarama's FijiFirst Party a narrow majority of 51.63 percent, well ahead of nearest rival the SODELPA Party on 38.05 percent. The National Federation Party on 7.5 percent is the only other grouping on the ballot to reach the five percent threshold needed to gain representation in the 51-seat parliament. An election winner may not be known for several days as votes trickle in from polling stations on the archipelago's more remote islands. Election officials also have to make alternative voting arrangements for constituents affected when torrential rain on Wednesday forced the closure of 23 polling stations. Turnout was as low as 53 percent in some districts, with many voters deciding against braving the tropical downpours to cast their ballot. The preliminary figures, if replicated in final results, would represent a resounding vote of confidence in Bainimarama after 12 years in power, eight of which saw him leading a military regime that ruled by decree. The island nation of 920,000 people has enjoyed sustained growth in its tourism-reliant economy under Bainimarama's watch. He has also made Fiji's foreign policy less reliant on Australia and New Zealand, which both tried to isolate his regime when he seized power, allowing China an increased role in aid and development. Supporters say he has helped heal racial divisions by introducing equal rights for Indian-Fijians, a sizable minority brought in to work on sugar plantations during British colonial rule. 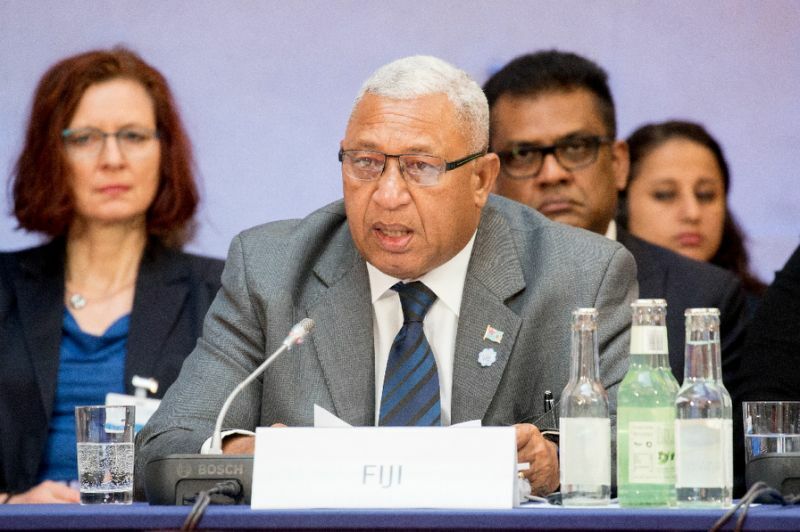 But critics, including Amnesty International, say some democratic fundamentals such as media freedom and the right to assembly remain inadequate under Bainimarama, who is notoriously sensitive to criticism. Fiji is by far the most populous and economically powerful of the South Pacific island nations and seen as a regional hub for business and diplomacy. University of the South Pacific academic Shailendra Singh said FijiFirst had its critics and had been accused of vote buying. But he said many Fijians were wary of a return to the upheavals experienced between 1987 and 2006. "People (are) voting for continuity, stability and what they regard as progress, versus change," he said. Suva voter Tevita Vuibau said Fijians would honour the result, regardless of who won. "The vast majority of Fijians realise that Fiji cannot afford another coup and for that I am thankful," he said.